South Korea’s exports set a new high of $600 billion in 2018 mainly driven by a strong performance in chips, petrochemicals and machinery, according to the government on Tuesday. 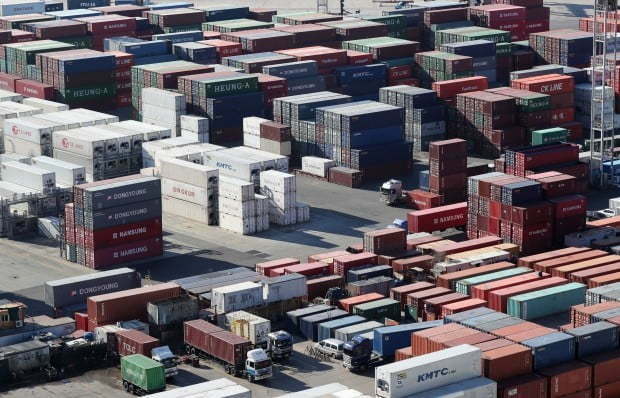 The Ministry of Trade, Industry and Energy said the nation’s trade volume hit a record high of $1.1 trillion, having a trade surplus of $70 billion. Exports stood at $605 billion, up 5.5 percent from 2017, and imports recorded $534 billion, an 11 percent rise during the same period. Chip exports played a key role in export growth, hitting a record $126.7 billion, up 29 percent from the previous year despite falling prices for memory chips. This is because the chips used for digital devices increased in capacity and demand for memory chips continued to increase, the ministry said. Petrochemical exports rose 12 percent on-year to reach $50 billion. Their growth was driven by rising unit prices due to a surge in oil prices. Exports of machinery reached an all-time high with a volume of $53.5 billion on the back of upward trends in construction and manufacturing in key nations and rising exports to emerging nations, including India. Exports from eight new industries also rose 6.9 percent to reach $78.8 billion combined. They were electric cars, new materials, bio-health, next-generation chips, next-generation displays, aerospace, energy and robots. The US and China were Korea’s two major export destinations, despite trade conflicts and growing protectionism. Korea’s exports to China reached the highest level ever with a volume of $162.2 billion, up 14.2 percent on-year due to the nation’s stable economic growth and a continued rise in exports centering on chips, petroleum goods, machinery and computers. Korea’s exports to the US rose 6 percent on-year to reach $72 billion on the back of rising exports of machinery amid the construction boom as well as rising exports of chips for use in data centers, artificial intelligence and 5G networks. Exports to the ASEAN region also rose 5.3 percent to reach $100 billion. The ministry forecasts that export conditions for Korea will be tougher this year due to a slowdown in the economic growth of key nations as well as trade conflicts between the US and China. The red light is also flashing for chips, the nation’s main export driver, which fell 8.3 percent last month on-year. The year-on-year drop was the first in 26 months, and the ministry attributes it to adjusted investments in the data centers of global tech firms and the fact that supply shortages for memory chips have been remedied to some extent. “(Still), we will continue to make efforts for the nation’s exports to reach $600 billion this year by actively responding to ongoing trade conflicts as well as exploring new southern markets,” said Sung Yun-mo, the Minister of Trade, Industry and Energy.